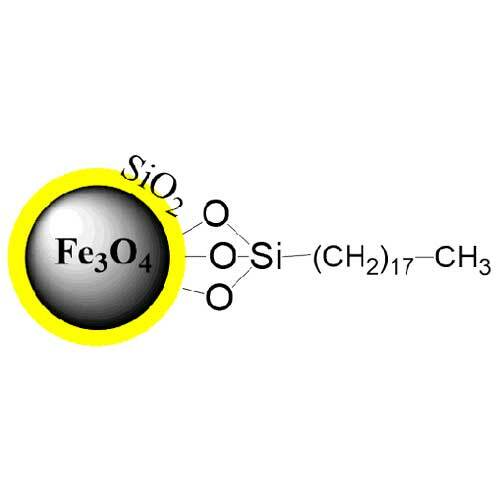 EPRUI C18 silica magnetic beads are silica coated iron oxide magnetic beads functionalized with hydrophobic C18 alkyl groups on the surface. It can rapidly enrich corresponding organic compounds from samples according to the principle of similar miscibility. It is an innovative product to replace the traditional solid phase extraction column SPE C18 (Reversed-Phase) magnetic Beads are ~ 1 um uniform, silica-based, superpara magnetic beads containing hydrophobic C18 Alkyl groups on their surface. The beads are specifically designed for quickly purifying, desalting and concentrating femtomolar to picomolar scale of peptides or proteins, manually or automatically without the need for laboriousrepeat of pipetting and centrifugation. EPRUI-MagC18 magnetic beads are recommended for purification, desalting and concentration of low molecular weight proteins or peptides. For low to intermediate molecular weight proteins,EPRUI-MagC8 magnetic beads are preferred.